What Makes Your Business Different? 4 Things To Help You Stand Out! The ability to stand out positively in your industry is important. It draws a definitive line between you and them. The more you stand out for the right reasons, the more opportunity you will have to close the sale, gain a new client, and crush sales goals. Have you thought about it lately? 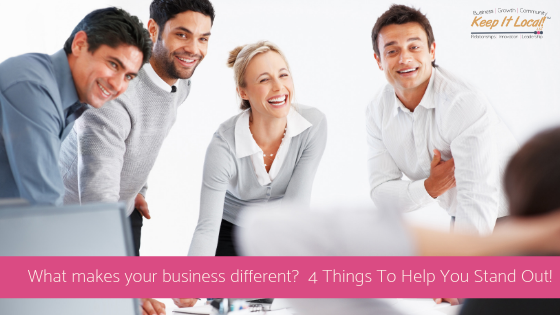 Have you thought about what makes your business different from the others? Today I am going to share with you 4 things that will help you stand out for the right reason and help you attract more business. Let’s Dive In! It might be helpful to grab a piece of paper and a pen. You may end up sketching out a new plan for your business. Get Clear On The Solution You Provide. What specific problem do you solve for your clients and customers? Get really granular when you go to answer this question. Think about who your favorite customer is and use them as your model. Describe that client really well and explore what unique problem you solve for them. Niche down! In other words, be choosy on who you decide to serve. Why? Having a narrow, well-defined target market will help you deliver rockstar service to those who have a specific problem you are solving for your audience. If you try to serve everyone, you will serve no one since not everyone has the problem you are an expert at solving. Ask for, collect and use testimonials. These are great things to use in social media campaigns because they provide social proof. Social proof helps to break down barriers and helps to provide trust in a digital world. If your social media audience can see the value and benefit someone received from your product or service, they will begin to feel more comfortable with your brand and be more open to doing business with you. Want to really stand out? This is game you need to play! Being regarded as an expert and thought leader in your field is the ideal way too positively stand out from your competition. Do this through utilizing tools readily available to you like blogging, offering opinions and industry forecasting, social media posts, ephemeral content, content marketing, live videos, eBooks, whitepapers, and the list goes on. The point here is to share your expertise through value, making you and your business the go-to resource in your field. Once you have all 4 of these items mapped out, you can now answer the question, “What makes your business different?” Now that you can see what makes you different, use that to your advantage. Use it in your marketing, your email signature, and how you talk to prospective clients and customers. Without knowing what makes your business different, you lose out on an organic competitive edge.